Big Author Day Book Signing Coming Up! Two weeks from this Saturday, on April 22, from 10:00 AM till 1:00 PM, a group of St. Clair Publications authors and some other author friends will be participating in a spectacular author anchor day at Magness Memorial Library at 118 West Main in McMinnville, Tennessee, I will be signing copies of both volumes of Most Comprehensive Origins of Cliches, Proverbs and Figurative Expressions, and have samples of some other books. St. Clair Publications authors joining me with their books will be Tammy Mentzer Brown, author of A Teacher’s Prayer, a marvelous true story about her struggles in youth in a divisive environment, and time in a children’s home, and how she persevered as a result of a caring teacher. Tammy has traveled to churches, schools and back to the children’s home as well as being a guest on Birmingham’s Fox TV to tell her marvelous story. ext will be children’s author, Dee Hall. Her illustrated book, Can You Imagine? is filled wit poetic verse which delights youngsters! She is having health issues at this time, but if she is able, we will be joined by Katy Ishee, author of the highly acclaimed book, Pieces of My Heart, the true story of how as a teen she gave birth to a baby which was forcibly taken from her. After going through a tumultuous life including time in Haight Ashbury, motorcycle gangs and traveling as a MASH double for Major Margaret ‘Hot Lips’ Houlihan, she made a vow to find her long lost son at any cost. She has been on television and the story has been read by celebrities. Also there will be my good friend, Country Music singer-songwriter, Sunday Sharpe! In the 1970s, Sunday hit # 11 with I’m Having Your Baby, written by Paul Anka, the female version of his huge hit, and # 18 with A Little at a Time, and had numerous other great songs on the charts. She was also nominated for an ACM Award in 1977. Sunday’s great novels, What Ever Happened to Bella Star? and What Ever Happened to Bella Star? 2 reveal the true story of what happens too many times to artists in Nashville as well as the music business in general. Other friends will take part including newspaper columnist and novelist, R.D. Sherrill, known locally as Deane, who writes fantastic murder mysteries! . As I have mentioned many times this month, Gerald Sinclair launched his and Rondo B B Me‘s new book, The Enigmatic Sinclairs, Volume One, at Rosslyn Chapel Visitor’s Center in Scotland on 6 October. Sales have been been fantastic. I am posting here one picture of Gerry at the signing (left) with Rosslyn Director, Ian Gardiner. A few days ago I posted the fact that several local St. Clair Publications authors were having September book signings, but was unsure as to when Tammy’s was. Then I posted the details of mine on the 3rd, the day following Labor Day. Well, it turns out that Tammy’s is at the same time as mine! Tammy’s moving true story, A Teacher’s Prayer, has touched and inspired many young people. It relates the crushing story of her youth after the death of her father, including abuse by those who should have been steering her in the right direction. She ended up in a children’s home. Then it tells of how one of her teachers, unbeknownst to her, never gave up on her, and prayed for her well-being for years. Consequently, she was able to rise above her abusive past and begin a life of positive affirmation, a loving marriage and obtain a college degree and give birth to two fine children. Now she is telling her story in schools, women’s groups, children’s homes and churches. She has been featured in a number of newspapers and on television. She has also developed and published a supplemental guide and leader’s edition for small groups to study her book. One week from today – YOU are invited! I fully understand that for some of you, attending my book signing is impossible–largely because you are too far away. But I wanted to send out a personal invitation to all friends of my blog and facebook. Hope to see you next Tuesday! Our authors are proud of their books. And rightfully so, because they have put so much of themselves into them and our covers are so attractive as well, thanks to Kent Hesselbein. Book signings are one way we authors get our books out to those who will appreciate our unique talents. Locally, we have two authors who have recently done signings. Peggy Ball presented her book, The A.C.T.S. of Prayer, a 365 day devotional, at Covenant Fellowship Church on Highway 55, Morrison, while Katy Ishee took her heart-wrenching true story of abuse and searching for her son, Pieces of My Heart, to the Annual meeting of Ghost Riders Motorcycle Club in Lenoir County, North Carolina in July. September will see at least four more of us heading out to signings locally in Middle Tennessee. I will be the first. On September 3 at Linebaugh Public Library at 105 W. Vine St. in Murfreesboro, I will be signing copies of Most Comprehensive Origins of Cliches, Proverbs and Figurative Expressions and The Best of Mother Goose in a private signing from 11:00 to 1:00. Then on September 7, Dee Hall will sign copies of her charming children’s book, Can You Imagine? mid day at Morrison Library at 130 W. Maple in that town, and Frank Tibbetts will be signing King of Hearts copies at Hastings Book Store 3905 N. Jackson, Tullahoma between 4:00 and 6:00 P.M. the same day. Tammy M. Brown will be signing copies of her best-selling true story of abuse and redemption, A Teacher’s Prayer at First Presbyterian Church in Tullahoma also in September. Date will be announced, or contact Tammy. One lady told me she would be at at least two of these events. So come on out. We would love to see you! Everyone in the area of Middle Tennessee is hereby invited to attend the book signing to be held this Saturday from 10:00 AM to 2:00 PM at the Coffee County Public Library on Hillsboro Rd. in Manchester. Ron Cunningham and I will both be in attendance to sign copies of our true crime books, Conspiracy in the Town that TIme Forgot, Conspiracy, Book II, in Search of Justice, and Reflections of an Investigator, In Search of Justice, Book III. Ron spent over thirty years in law enforcement and at one time had a contract out on his life. I will also have some copies of On the Origin of the Cliches and Evolution of Idioms. Several other authors will also be in attendance. Hope to see you there! It was such a great pleasure spending the day Saturday at the Historical Society in Franklin, NC with my good friend and co-author, Ron Cunningham and seeing some old friends and meeting new ones. The weather couldn’t have been more cooperative and the folks at the museum were such a joy to work with. I found that one of my high school teachers, Clayton Ramsey, was recieving an award that very day. While there I saw some ladies with whom I went to school who are now also authors, Gail Shepherd Deitrich and Gail Kelly Lester. I have begun reading their delightful book, Tales of Two Gails and am finding that so many of our experiences as youth were parallel. After I finish I will be doing a review for my blog. It is available at their web site www.talesoftwogails.com . I already know that I can highly recommend it. Also, after the signing, we went to Mason Mountain Ruby Mine, and I was delighted to meet a young lady that is looking forward to working with her husband to write the story of their family’s ownership and management of the mine over the past several generations. I’m looking forward to that as well. Franklin, NC, here we come! Tomorrow morning Ron Cunningham, Rhonda and I will be heading out for Franklin, North Carolina where Ron and I will be spending Saturday at the Macon County Historical Society signing books. But the main books we will be there to promote are Ron’s and my true trime dramas, Conspiracy in the Town that Time Forgot, Conspiracy Book II, In Pursuit of Justce, and Reflections of an Investigator, In Persuit of Justice, Book III. 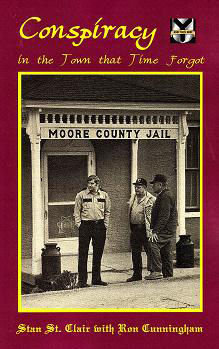 They are the stories of Ron’s exciting career in law enforcement and the contract out on his life when he was a sheriff. If you are anywhere near Franklin this weekend, look us up.